If you would like to add your testimonial, please contact us. "This is to confirm that the monies for the sale ot Triptych are safely in our bank account. Very many thanks for your assistance in this matter." "You come highly recommended, not just by Alan but other colleagues in the RACYC. I would value a chat if you have a moment. Many thanks for transfer received today, mixed emotions about parting with the Boat, we had some great times in the early yearsunfortunately the last few years I've not been able to hop on & off liketimes past. Derek has great plans for the Boat & I'm sure I'll see it again.
"" After dealing with you on the purchase of Melos 11, a very pleasant and rewarding experience in itself, it was a no brainier to appoint you to sell Calsara. A successful purchaser was found within three days of the Calsara sale details going live on your website. Completion then followed very smoothly, with the sale being completed within two weeks from start to finish. It has been a pleasure dealing with you on both transactions. I appreciate the way you do business, especially the level of integrity and consideration you bring to proceedings. Very refreshing, so well done Simon!" I thought I'd write you an email by way of thanks for a good job well done. I would/ have recommended your services to anyone considering putting their yacht on the market and feel that your enthusiasm, understanding of my yacht and integrity were key elements in achieving a good sale. "I wanted to send you a thank you for all the hard work and diligence you put into both the sale of my existing boat and my purchase of a new one. You made both experiences thoroughly enjoyable and frictionless, which is a testament to the hard work and attention to detail you put in behind the scenes. Your after sales service has also been first class and you have gone above and beyond in tying up all the loose ends and making sure nothing has been left outstanding. Good old fashioned (personal) customer service - something that's not there in most businesses these days. Nice work! "That's good news. Thanks for all your hard work on the sale of our HOD 35 'Psipsina'"
"Thank you for this and your support and involvement throughout this very difficult episode. Compared to others in your industry I had the misfortune of dealing with you've been a breath of fresh air. Thank you for your cooperation and help with my purchase of Bavaria 38' 'Orca' from Greece. Simon,I appreciate very much your efforts to help me by organising a Notarised and Apostilled Bill of Sale in order I could register my new yacht in Israel. "A pleasure doing business with you !! Just a note to say we arrived safely in Strangford Lough at 10.00 on Saturday morning. We made good time despite a wide variety of conditions. Lion is a wonderful boat and I am looking forward to some good sailing. Thank you for all your help in the transaction. I think we have established a good relationship for any future dealings. I will be pleased to promote Boatmatch.com to all my friends. "We would both like to put on record our thanks to you for the professionalism and tenacity you demonstrated throughout our purchase process. Your knowledge and passion were invaluable and we really enjoyed the whole process. You really can't beat the personal touch! I will have no hesitation in using Boatmatch.com in the future and will highly recommend you to friends. Kindest regards Simon and Paula. "Dear Simon, I have pleasure in enclosing a cheque for the balance due on the purchase of our Discovery 55'. I've said it before, but thank you again for all your help throughout the entire process, the research, the overseas inspections and the acquision. "SIMON - Money in my account OK. Thank you for all your good help. Very best wishes - Roger. Owner Colvic Suncruiser 35' 'Silver Star'"
"Many thanks for all your practical help, patience and support throughout the whole process, especially in sorting out a slot with GBY. Much appreciated. " Thanks for your help and ultimate service when I for the first time bought a boat from England. You provided all possible information regarding the boat. Your knowledge of the boat and the boat type gave me the necessary confidence to take the ‘big decision’ ! I am very grateful for all your help with practical details as arranging a survey, winter storage, arranging a small repair etc. this service was much more than expected. I will definitely recommend Boatmatch for everyone planning to buy or sell their boat and will contact you again if I in the future is getting new or other boat plans. "Thank you for your prompt remittance in respect of the sale of yacht 'Shere Khan' sold on my behalf. The sale was complicated by the particular international and cross-border considerations of the insolvency procedure. Your assistance during the initial stages was invaluable to approaching the marketing and sale in the circumstances and your guidance in respect of the paperwork kept my queries to a minimum. Given the issues involving the substantial marina charges that had been outstanding for a considerable period, your negotiations with the marina in Spain were invaluable. Completion of the sale and delivery up of the vessel to the purchaser was a smooth exercise that I could not have managed without your assistance. You kept me fully informed of developments on a timely basis and the sale was achieved in a most professional and efficient manner. I will recommend you to my Business and Insolvency Practioner colleagues without reservation." Mr Walworth handled the sales process from start to finish in a very efficient and professional manner. The sale of the yacht was completed within a couple of months and any issues arising were handled effectively and promptly. "We wish to thank you for the amazingly professional service you gave us in selling our yacht in a matter of a few days, for the full asking price and for the completion of the deal within two weeks. Only by our singing your praises did we find that you sold our best friends yacht for them. We presume you are not always as successful so quickly but your website, the amount of effort you expend and the undoubted professionalism undoubtably brought us the success. Your advice was spot on as well. " "Thank you very much for an easy sale, and helping secure a good and fair price for eXtasy." "I just want to say a huge thank you for your professional services in selling 'Island Dreamer'." Thanks so much for your message and your very professional manner in handling the situation. I would have no hesitation in recommending Boatmatch to a potential vendor or purchaser. "I knew the successful sale of my X-Yachts 332 would require good exposure to clients from NW Europe. Boatmatch, and particularly Simon, achieved this within a very short space of time, not only concluding in a smoothly achieved sale but a waiting list for the boat in the unlikely event the sale should collapse. I couldn't have asked for more. Thankyou." "Thank you for selling my Fairline Targa 40'. Fantastic service well done -would recommend you to anyone. "We were very impressed with your professional attitude and the fact that you sold our boat within 3 weeks when we have been with other brokers and on web sites for the past 2 years with no success!!!!! "Thanks for the receipts and the photos! Serenity of Shamrock has arrived safely, everything went smoothly and nothing was broken. She is in a very good condition as you and David Shaw told us, we are very happy with her! Now we just have to wait for the ice to melt in our waters so we can put her in and go for a seatrial, we think she will fullfill our expectations. It has been a pleasure to deal with you, we would gladly recommend you to other buyers and sellers. Thank you for now. "Thank you for all the help you have given us in the purchase of our new Nimbus 320"
"Just a line to say thank you, I know I supplied a great product at a great price which is the key to sell anything. But once again you supplied perfect service and a buyer in 2 days. What a team." "I'm glad to tell you that Mystery is now settled on her new berth in West Wales. I cannot thank you enough for your help and support in the whole purchase process. Using Boatmatch proved to be a simple, quick and totally pain free process. I will have absolutely no hesitation in recommending you to any friends and/or colleagues looking to purchase or sell a boat and have already done so to my father, looking to sell his Grand Banks. We hope to have much fun and enjoyment cruising in Mystery. I would just like you to know that it has been a pleasure to deal with Boatmatch in the purchase of our Windy Grand Mistral HT. From my first phone call to Boatmatch and the quick response to e-mails (you would not believe how a couple of independent brokers I e-mailed with just zero response) the level of service went well beyond what I would have expected, especially running around getting paperwork to people to get the sale through as quickly as possible to enable my family to enjoy our last few days of our weeks holiday on the new purchase. It is also very gratifying that when the sale went through and effectively the brokers bit has been done, the service still continued. In a world where service can be very poor, it is nice to deal with a company where it is top of priorities, I cannot recommend Boatmatch enough, and if you are selling the 4% fee is a huge saving. "Congratulations Boatmatch on a steadfast, dogged, persuasive, imaginitive, optimistic and clever campaign to sell my boat. I am truly grateful, so thank you, thank you, thank you"
"I've arrived back a couple of days ago after the long job of getting Kerenza (now Janet) from Arzal down to Portimao in the Algarve. I thought I'd drop you both a quick note to let you know that everything went fine although things were a little protracted mainly due to a delay in the transport arriving from Portugal due to the bad weather in northern Portugal / Spain over the last couple of weeks. Many thanks to both of you for making the transition in ownership as painless as it was, all the paperwork onboard as promised and ready to go, made life in Arzal easy for me. "Having unsuccesfully tried a local broker, it seemed worthwhile to try a net based attempt to sell my Moody 36cc sailing cruiser. Boatmatch were very professional all the way through the process, introducing three or four potential purchasers to me. The final enquirer was a high quality contact who agreed a cash sale agreable to all." "Buying a boat is a pleasurable, but actually a complicated and potentially stressful process. Simon (Boatmatch) was enormously helpful and treated us more like friends then just another client. Difficulties in the process were dealt with calmly and efficiently. Everything that was promised to be done was done. When the boat was surveyed he arranged this on his and the independent surveyors day off, with a marina that didn't do lifts on Saturdays to fit in with us. When we took delivery of the boat Simon helped us move the boat to another marina, again on his day off - brilliant! If you can find the right boat for sale with Boatmatch you will find it hard to deal with a better broker. "I must commend the broker - Simon Walworth from boatmatch.com - he really spent a lot of time on the sale and did put himself out on more than one occasion - even more commendable considering the 4% commission he charges." "Thank you for helping me buy my Fairline Phantom 40 in 2004 and selling her on my behalf in May 2008. Your service has been excellent both when I bought and sold her. For an internet company, with reduced opportunities for face to face negotiations, you have been most attentive and available. I will have no hesitation in recommending your company to other boat owners I know. The lengthy and complicated sale of a large yacht was handled with professionalism and attention to detail. "Unfortunately there was no time in Hamble to say thank you for your extraordinary assistance and to have some beers. I hope we can do this when we will be there on the 20th of February. "Boatmatch.com do it as it should be done! A lot of brokers can learn lessons from the way Boatmatch conduct their business. Boatmatch do actually earn their commission. Just to say many thanks for the superb service you gave with regard to the sale and purchase of my boat. As you know this was my first purchase and you made it so easy for me arranging everything so professionally; not knowing anything about boats I was fearful of making a blunder. However I needn't have had any fear as the confidence you portrayed put me at ease. The advertising of the boat was accurate and as soon as I saw the outside of the craft I was delighted and as you know bought it. If I purchase another I will call on you. Once again many thanks for your expertise. "Thank you very much for your help and assistance with the successful transfer of the boat. Should I rejoin the boating fraternity at some point in the future I will be sure to come back to you to see what is available. Many thanks again. Roy"
"Many thanks for an excellent service at the purchase of a Princess 420. Not only finding the boat but also contacting the transport company and helping us out with all the proper documentation associated to the boat. As a foreign buyer we felt safe and secure throughout the whole process from viewing the boat to final delivery due to Simon taking good care of everything. We will recommend Boatmatch as the first choice to all our friends. " "I bought my boat from the UK and exported her to Belgium. Mr. Simon Walworth is a very reliable person, everything what I ask he has done, correct in all papers and payment, he has helped me well." "Thank you boatmatch for making sure everything went so smoothly with my purchase of a Princess 420. I was really worried about buying and importing my new boat from the UK, but you made the whole thing easy to understand, most importantly made sure she was loaded safely and shipped to me! I am recommending you to my boating friends, it is so good to deal with a company who took such a personal interest in my purchase. "Thank you very much for the helpful and professional service we have received from you in connection with the sale of our Princess 420. All our concerns regarding the sale to a buyer from abroad were dealt with very efficiently and you expertly guided us through the process which ws very reassuring. We will recommend the service of Boatmatch to our friends." I cannot tell you how pleased both Lynn and I are about Golden Rule, she is truly everything we wanted in a boat. Many thanks for all your patience, help and advice during the sale." "Pain and pleasure of buying via the web. Dear Sir, when I decided to take the plunge and buy my first boat, I thought the best approach was to trawl the internet. Via email and on line forms, I contacted 17 brokers on 22 different boats I had seen advertised and was amazed that only 11 even bothered to answer my e-mail, and that only five could supply any extra details or images straight away. Finally found a broker at www.boatmatch.com who was as enthusiastic as I was and responded immediately to my requests. Consequently, I am now the proud owner of a Sealine F43. The whole buying experience went smoothly and the broker even helped me get a great price to get her delivered to her new mooring. 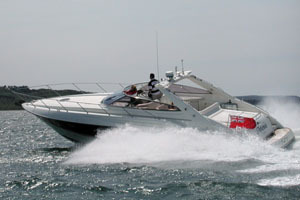 Colin R Casey by e-mail"
"Boatmatch handled the purchase of my Sunseeker 47' completely. I relied on their expertise and description of the boat, all I did was send the money! They did everything, even arranging delivery to Denmark in time for me to collect the boat on my summer leave from Singapore. They are great guys at boatmatch." "I bought my Fairline Targa 40 through boatmatch.com. They are very easy to deal with, they arranged everything from viewing to shipping...most professional." "I have bought and sold 2 boats from boatmatch. They are very straightforward and easy to work with and represent real value at half the normal cost." "Thanks to the internet, I found the boat I had been looking for through boatmatch. Problem was my being in New Zealand and the yacht based in Turkey. The boatmatch team took this all in their stride and help me arrange everything. What a truly global approach to yachtbroking." "I sold my Fairline Targa 40 and my Fairline 50 through boatmatch after a friend recommended them ..... they organised both sales including viewings, survey and sea trials. At half the cost of other brokers, they represent great value." "I bought my Hod 35 through boatmatch, the team were responsive, extremely well informed and professional. Thanks Boatmatch"
"I sold my Princess 65 through Boatmatch, half the charge other brokers levy, represented a massive saving for me. The sale was handled efficiently and professionally, well done." "I have sold 2 power boats through boatmatch at half the cost of other brokers, and bought 1 at a great price.....well done the boatmatch team....they have saved me thousands!!!!!!" "I have bought and sold 2 boats through boatmatch, at half the cost of other brokers to sell there can be no other choice"
"I bought my first boat through boatmatch.....very helpful team, I shall encourage all my friends to use boatmatch.com"
"I bought my Targa 37' through boatmatch. They collected me from Southampton airport when I came to inspect the boat, helped arrange survey and shipping the boat to Norway. They ensured the papers were correctly signed off by the Norwegian Embassy. Well done for a great job "